Map of Ancient Glaciers of the Yosemite Region By F. E. Matthes. A fine example of Francois e. Matthes' 1930 geological survey map of the spectacular Ancient Glaciers of the Yosemite Valley, California. Centered on Liberty Cap, the map depicts the ice streams of the Wisconsin glaciation and covers from Mammoth peak to the south fork of the Merced River. Throughout countless well known Yosemite sites are noted, including old Inspiration point, Pinoche Peak Trail, and Half Dome, as well as various peaks, meadows, trails, mountain passes, rivers and creeks. The glaciers in the Yosemite formed over a million years ago and as they moved down, they carved the rocks into the U-shaped valley we know today. The map is color coded and shows the direction of the flow of the glaciers. 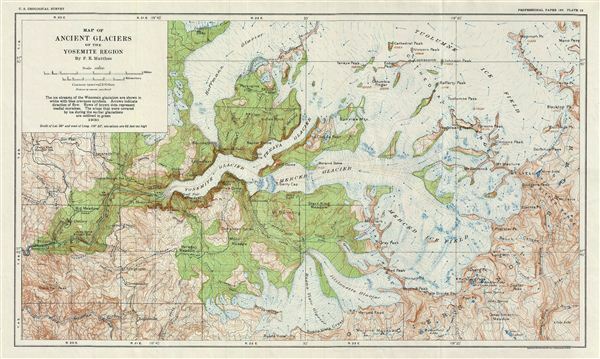 This particular map was published as plate 39 by the United States Geological Survey in 1930 as part of the Geological History of the Yosemite Valley.